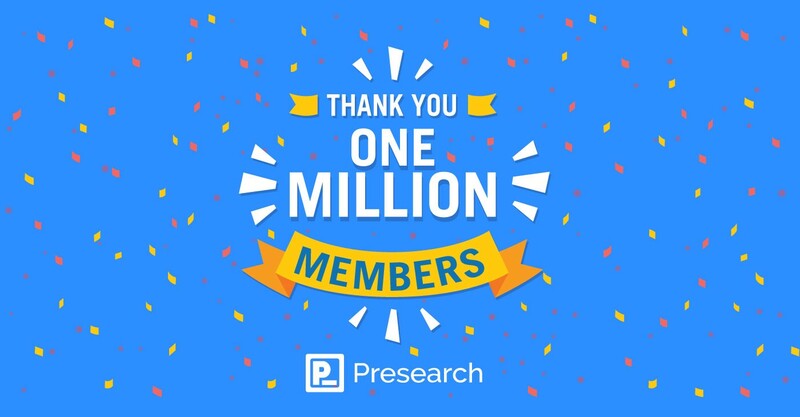 Presearch reaches 1 million members! In the early hours of April 10, 2019, we welcomed our 1 millionth member. This is such an exhilarating milestone for the Presearch Team, one that has come after hard work and long hours; one we couldn’t have reached without our fantastic community of Presearchers! Every day since we launched in closed beta in November 2017, our members have been using Presearch to get the information that they need. You are making a conscious decision to choose an alternative to the standard search engines. You want access to unfiltered search results that we are happy to provide. The announcement for Presearch’s public release was made on April 9, 2018. Twelve months and one day later, there are now (1) one million registered members. While the road to 1 million hasn’t been without its share of twists and turns, we listen to every piece of feedback, and in turn, create a better search engine for our members. We happily take feedback from our members and have created a more transparent token system, the Presearch Rewards Verification System (RVS). This system, implemented in February of 2019 allows all members to see their PRE Level in real-time, with feedback provided on their authentic search habits on a weekly basis. In March of 2019, we released version 1.0 of the Presearch Token Marketplace. This is the solid base for the ad platform (coming soon! ), and will ultimately enable PRE buyers to connect directly with PRE sellers in a peer-to-peer situation directly within Presearch. In today’s world, we have the double-edged sword of having short attention spans and wanting instantaneous results. The Presearch autocomplete feature, released December 2018, satisfies both of these requirements of modern day life. Sharing a wide range of search results with our members is one of the key foundational blocks of Presearch. When you search the internet using only one or two search providers, you are most likely getting a narrower view of the answers you are looking for. By creating new partnerships with multiple search providers Presearch is opening up the world of search results for everyone! Twitter reached 1 million users in 21 months. Within 22 short months of their launch, Steemit crossed the 1 million user threshold. Facebook reached 1 million users 10 months after its launch. Scribd announced its growth to 1 million users after 10 months. This milestone is an important one for Presearch, one that will continue to push us to up our game and move to the next level! So, we now continue to plan the work and work the plan. Presearch Browser Extension — A seamless tool that gets Presearchers the results they need the quickest and easiest way possible collecting PRE tokens. Presearch Ad Platform — A fully integrated ad platform that will let businesses connect with a highly-engaged audience at an unparallelled cost-per-click. Again, a great big thank you to all the Presearchers who jumped on board with us and have reaped the rewards of using a better search engine! We can’t wait to see what the next few months bring, and we are so happy you are helping drive the project forward. If you are a currently a Presearcher (yes, you! ), please clap for this article. If you know someone who should be using Presearch, please share this article. Presearch is a decentralized search framework that doesn’t collect your personal information. Earn PRE tokens for searching with over 80 different providers, getting fast and convenient results.